Death is certain for all living things, including the body's cells. The act of dying is in fact as sophisticated as any process a cell might perform during its lifetime–and when glitches in cell death occur, they can lead to disease or developmental defects. A team of Rockefeller scientists led by Shai Shaham are interested not only in how cells die, but also in what happens to their corpses. When a cell begins to self-destroy, other cells descend on it to clear away the remnants, which could cause harm if left to loiter. In particular, perishing cells with elaborate shapes–like certain neurons, for example–pose challenges for phagocytes, the cells whose task it is to vacuum up cellular debris. Now, the researchers report on an unusual cell-death process whose discovery could shed new light on how cells bury their dead. 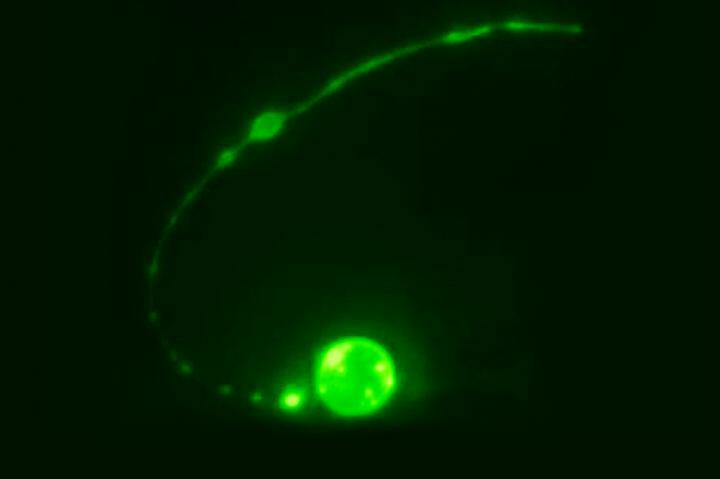 Working in C. elegans, a microscopic worm, the team zeroed in on a particular cell called the tail-spike cell, which sports a long, slender extension. This cell provides structural support during the tail's formation, after which, considering its mission accomplished, it dies. In examining the death of the tail-spike cell, Piya Ghose, a postdoctoral fellow in the lab and lead author of a recent report published in Nature Cell Biology, saw that it looked nothing like other cell-death processes. "Curiously, the middle of the cell is spliced out first," Ghose says. Indeed, images captured by the team reveal that the process begins with the core part of the cell being severed from its extension, then rounding itself up and gradually disintegrating. The lingering extension vanishes in two steps, driven by different degenerative processes. "The part of the extension closest to the cell body is broken up into bead-shaped bits," Ghose says, "while the distal part retracts into a ball, which is then removed by a neighboring cell." It would be easy to dismiss the whole process as a biological quirk–a phenomenon with little relevance for anything but the C. elegans tail-spike cell–if it weren't for the fact that the researchers have watched another worm cell, a neuron, die in the exact same way. "Since we see this phenomenon in two different cell types with complicated shapes, it is conceivable that similar death events occur in many animals, and perhaps even in human disease," says Shaham, who is Rockefeller's Richard E. Salomon Family Professor. What's more, in delving into the mechanisms that drive this "compartmentalized" death, his team made discoveries that will be useful for understanding the general way in which phagocytes–the body's vacuum cleaners–go about their job. For example, Ghose and Shaham have found that a protein called EFF-1 helps a phagocyte seal its arm-like extensions around a dead cell remnant, allowing it to quickly gobble it up. "How such sealing takes place had been a long-standing mystery," Shaham says. He believes that these findings may represent the beginnings of an entire molecular framework that remains to be explored. "There is a lot we don't understand about this remarkable death process," he says, "and we are hot on the trail of additional players."